I meant to write this recipe for ages but I never got a chance to cook it at home in the past year at all till this holiday. This sour curry is very easy to cook but it needs many ingredients and it takes time to prep. Normally, given that I am a bit lazy & very busy lately, I like cooking something simple and easy (I am a product of my time.) 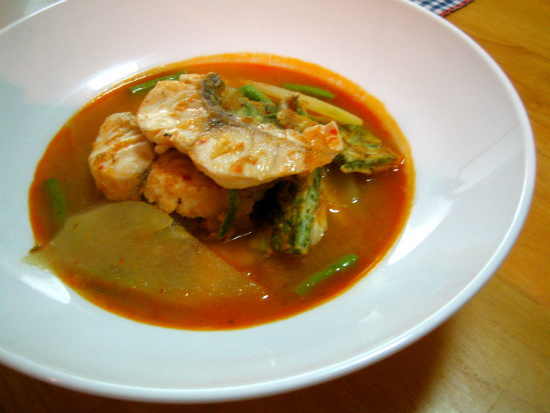 Sour Curry or "Geang Som" is one of my most favourite Thai dishes. Everytime when I get to go out dining at any decent Thai restaurants, I often order this dish. I just love it and I like to try/see how (good or bad) other people execute this dish. My mum cooks a mean dish of Keang Som. I think anything thats cooked by mum is always delicious.. eh? Anyway, Keang Som is a dish thats good to cook with seafood (Sea fish or shrimp). I find that it is best eaten a day after its cooked as when you leave it over night, the curry has time to rest, settle and develop the flavour. Set a pot with water on high heat, bring to the boil. Add half of shrimp/seabass, leave till cooked through. Do not stir. Turn off the heat, remove and keep dried one side. Now the broth, set another large pot with water on medium-high heat, bring to the boil. Add curry paste, bring to the boil again. Add the second half of fresh shrimp/seabass. Do not stir and leave to cook. Wait till the broth is back to the boil. Add vegetables (You can always add many kind of vegetables as you like ; like Chinese cabbage, daikon, raw papaya, young water melon, long bean, cauliflower, Thai morning glory and water mimosa. The veggies added in this sour curry are your own choice, or in Thailand, people add seasonal veggies - what is available at the market, as you can see from my picture shown above that I only added what I like eating.) Add fish sauce, tamarind paste and a little of palm sugar. Taste if more seasoning is needed. The soup should taste spicy, salty, slightly sweet and very sour. To me its important to not leave the vegetables in the hot broth too long as I like my veggies green and crunchy. Turn off the heat. Squeeze some lime on top just before serving. (It needs to taste tangy to be delicious. If you added the lime while its cooking, the sour favour would be disappeared/ruined by the heat.) Serve hot with a cup of steamed wholegrain rice. Absolutely delicious!